By Rodney Burton [CC BY-SA 2.0], via Wikimedia Commons. This line descends to me via my paternal grandmother, Doris Brooker nee Smith. Her paternal grandmother was Ann Smith nee Peach. She lived during the 19th Century in Attleborough, Norfolk, but her origins baffled me for years before online genealogical research enabled me to crack it. I published how I cracked it, and her father's story here. 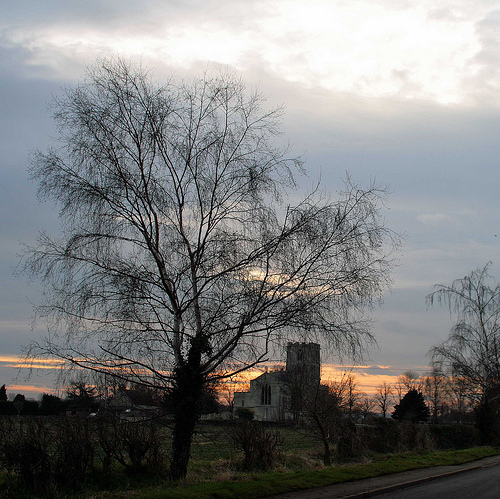 In brief, her mother, Sarah, was born Sarah Riches near to Attleborough in Norfolk at Great Hockham in 1812. Then ... somehow, she met a David Peach, from the East Midlands. He was a shepherd and drover, and I'm best guessing that his vocation brought him into contact with a Norfolk bride. He may have been droving livestock to Norfolk pastures or markets. She returned to his home, in Etton. Etton, is a village on East Midland county borders that has fluctuated in history between Northamptonshire, Lincolnshire, Cambridgeshire, and the modern district of Peterborough. It was this fuzziness that hid his roots from me for a little longer. They married in Etton in 1835. Their daughter, and my ancestor, Ann Peach, was born later that year at Etton. In 1837, her father David Peach was convicted at Lincoln Assize Courts of stealing two cattle. He was sentenced to Life Transportation to Van Diemen's Land (Tasmania). He went on to be transferred to a particularly tough penal colony in Tasmania. He was eventually pardoned, but not granted licence to return to England. Meanwhile, his wife Sarah, and her young daughter, Ann, somehow managed to return to Norfolk, where she found refuge with her parents, now living in the market town of Attleborough. For a while they went to live on as servants. For years, Sarah remained in Attleborough, never remarrying, although she had at least two more children. She worked to support herself and her children as a charwoman or washer woman, working a laundry. But ... where were the roots of her East Midland Shepherd husband, David Peach? I suspected that he was local to the Etton area. Inquiries at various FHS stands at the 2016 Who do you think you are? event in Birmingham had lead me to this position. Peach's seemed to be local, but the county boundaries kept changing. I suspected the Stamford area. Then a fresh search today. I've recently taken out a month worth of subscription to Ancestry.co.uk. They appear to have had a lot of Northamptonshire County Council archive records, indexes, and digitalised images added. There, I found his family! The ancestors via David Peach that I discovered today (see the above direct tree) were entirely from the parish next to Etton, the parish of Maxey. 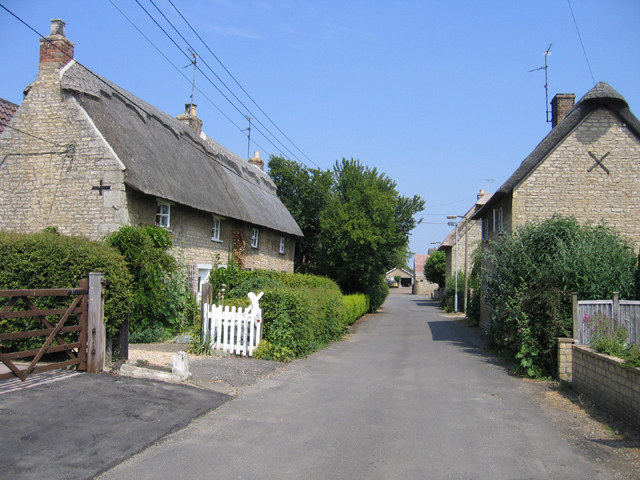 This village today belongs to the District of Peterborough, and has been associated with Cambridgeshire and Lincolnshire - but back then, fell within the County of Northampton. The Peach family seem to have been shepherds and drovers for a few generations at Maxey. David was baptised at Maxey in early 1807, the son of John and Ann Peach of that village. His father had taken the name of an elder brother that had died as an infant, while their mother was carrying him. The elder John had been the twin brother of Joseph Peach. Joseph turns up as a witness at so many 18th Century Maxey weddings that I'm guessing that he had some sort of local office in the parish, or was a particularly popular man! Our John (the 2nd), was relatively quiet on record, and unfortunately my search didn't reveal his marriage, nor the surname of his own wife Ann. He did witness his elder brother's Joseph wedding alongside an Ann Mason. Who knows? 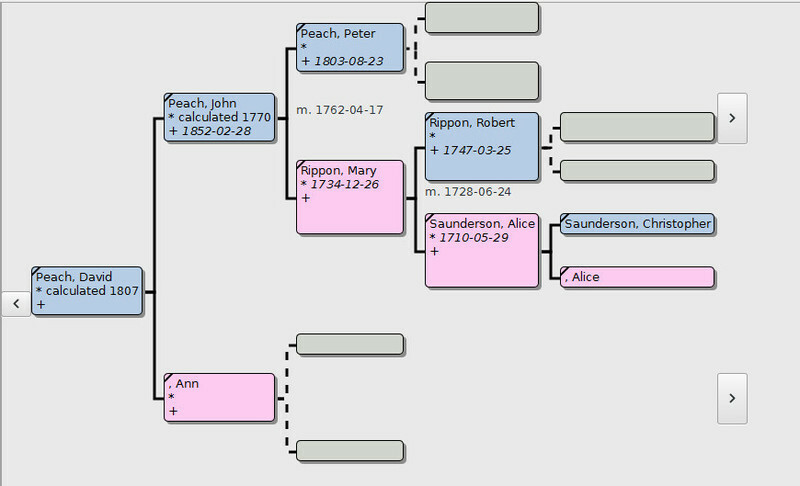 Our ancestor John Peach's parents were a Maxey couple, that married there in 1762 - Peter Peach and Mary Rippon. I can then trace Mary's baptism and parents in Maxey - she was baptised there in 1734. Her father was Robert Rippon, a Maxey tailor. He married our ancestor Alice Saunderson at Maxey in 1710. Her parents in turn were Christopher and Alice Saunderson of Maxey. And so ends today's family history lesson. I now have 243 direct ancestors named in the tree. I did add new siblings where I could find them by trawling the online digitalised images of the parish records and bishop's transcripts.